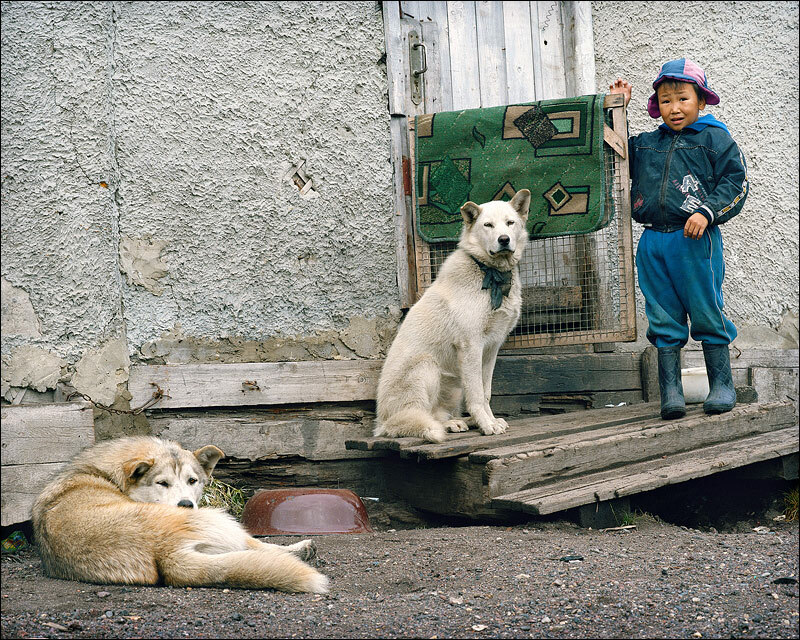 At the eastern end of the Russian Federation, a boy in Chukotka stands with his huskies. Photo: Flickr/Misha Maslennikov, Creative Commons license. On an overcast day in August, Russian President Vladimir Putin put aside his phone calls to German Chancellor Angela Merkel in order to speak with graduate students and teachers attending the 10th All-Russian Youth Forum at Lake Seliger near Tver, a city a north of Moscow. Pro-Kremlin youth at the camp asked Putin about topics ranging from Ukraine to teachers’ wages. His responses generated headlines in newspapers like The Guardian (“Putin likens Ukraine’s forces to Nazis and threatens standoff in the Arctic”), with Western journalists fretting over his desire to strengthen the country’s position in the circumpolar north. Despite the media frenzy, Putin’s statement was boilerplate when it comes to the Arctic. He hardly threatened a standoff. In fact, later in his answer, he mentioned that Russia’s militarization of the Arctic was being done in order to “secure the passage of convoys of ships and trade routes, and not in order to fight and confront someone out there.” Of course, these days, Putin’s words have to be taken with a huge grain of salt. Regardless, more interesting than Putin’s boilerplate speech was his discussion of the administration and development of territories in the Arctic and elsewhere in Russia, including Crimea. Though a seemingly wonkish topic, Putin’s brief overview illustrates the increasing reach of Moscow in the lives of people thousands of miles away from the capital, from Crimean Tatars to Chukchi dog mushers (who, it’s alleged, have “never been conquered by Russian troops” but were once governed by billionare Chelsea owner Roman Abramovich, and who also developed the Siberian husky breed). Since May 2012, Russia has had a Ministry for Development of Russian Far East. Since March 2014, it has also had a Ministry for Development of Crimean Affairs, and since May 2014, it has had a Ministry of North Caucasus Affairs. 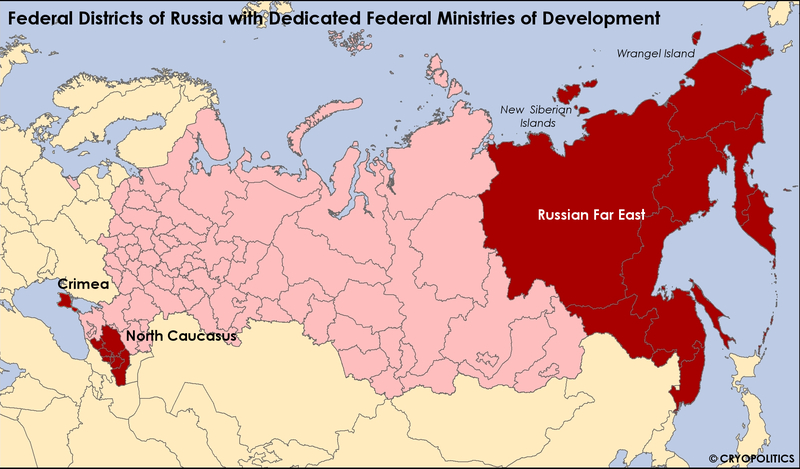 With the Russian Far East, Crimea, and the Caucasus all having their own dedicated federal ministries for development, these regions lying at Russia’s most distant ends are now all united under the iron fist of the Kremlin. “The Arctic plays for us a very important role in terms of our security because unfortunately, it’s the case that the United States has concentrated attack submarines not far from Norway’s coast, which can strike Moscow within 15 to 16 minutes, I remind you. The first sentence of this last paragraph, where Putin discusses strengthening the country’s position in the Arctic, is the one which The Guardian cited. But it’s actually the following sentences that are more interesting. Here, Putin underscores the importance of going back to the individual territories, including the islands, by which he means the islands along the Northern Sea Route. One such place is the New Siberian Islands, which is the site of a new year-round military installation, as the Barents Observer reports. Another island of interest is Wrangel Island,which falls under the jurisdiction of the Chukotka Autonomous Okrug and lies at the eastern end of the Northern Sea Route. Both the New Siberian Islands and Wrangel Island happen to fall within the Russian Far East, for which there is a relatively new federal ministry for development, just as there is for Crimea and, even more recently, the North Caucasus. This makes it easier for Moscow to directly oversee the Arctic islands’ development. 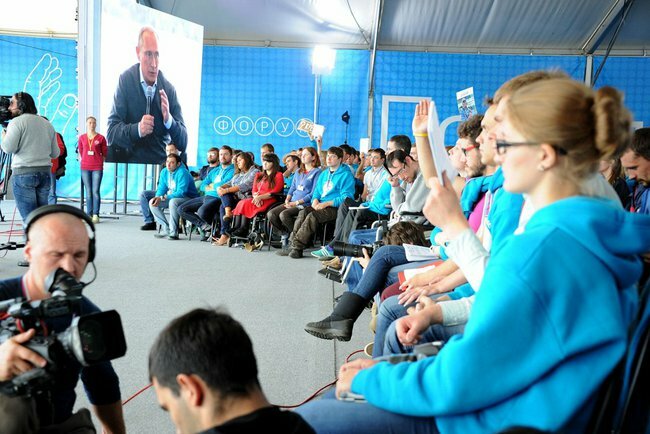 Russian President Vladimir Putin speaks to youth at Seliger-2014. © Press and Information Office of the President of Russia. Russia, like other federal countries including Canada and the United States, has different levels of subdivisions. Whereas Canada has provinces and territories and the U.S. has states, territories, and American Indian reservations, among others, Russia has six types of federal subjects: krais, oblasts, republics, federal cities, one autonomous oblast, and one autonomous okrug (Chukotka). Krais and oblasts are the most common type of political subdivision, and the two are relatively equivalent. Republics, such as Crimea and also Chechnya, tend to have ethnic minorities and are on paper more autonomous than a krai or oblast. They can have their own official languages, constitutions, and legislatures, for instance. Somewhat similarly, autonomous okrugs, like Chukotka or Yamalo-Nenets, also are home to ethnic minorities and are supposed to have increased legal rights. Federal cities are those such as St. Petersburg and Moscow. The March 2014 treaty (not recognized by most countries) between Russia and the Republic of Crimea turned the latter into a republic of Russia, while the city of Sevastapol became a federal city. But that’s not all: since 2000, Russia has also been divided into federal districts, a reform made in order to “strengthen the unity of the state,” according to a federal decree. Russian scholar Dr. Cameron Ross, at the University of Dundee, has called these political reforms made by Putin “a mockery of federalism.” Notably, the federal districts hew closely to the outlines of the country’s military districts. Each has a plenipotentiary representative who is appointed by and represents the Russian president, and the representative is supposed to ensure adherence to the Russian constitution and the execution of Russian federal law. The federal districts seem to be only growing in importance, especially given the recent proliferation of federal development ministries. Since the annexation of Crimea, there have been nine federal districts, and three of them now have a dedicated federal development ministry: the Far Eastern Federal District, the Crimean Federal District, and the North Caucasian Federal District. Moscow’s close oversight of these districts’ development outweighs the fact that these political subdivisions are composed of numerous republics and autonomous okrugs which should, in theory, be able to exercise more autonomy than krais or oblasts. The Russian Far East, for instance, is home to the Jewish Autonomous Oblast, the Chukotka Autonomous Okrug, and a range of other subdivisions, while the North Caucasus includes six republics and one krai. “Now, regarding the territorial-administrative division and the organization of work in these areas. We have a federal state and we have some territories that are all immersed in the subjects of the Russian Federation, which have certain rights in the management of these areas. There are some functions, which are assigned to the federal government, and some of the functions are assigned to the regional and local governments. Of course, in some cases, where special attention is required, we create … Yes, by the way, in some countries, in spite of their federal structure, some of the territories are under direct federal submission. This practice exists throughout the world, it’s true. By and large, though nothing prevents us from doing it, those plans have yet to materialize. So is Moscow moving towards more centralized administration of its federal districts? Even Putin does not know. But the mere inclusion of Crimea and the Russian Far East in the same sentence is geographically mind-boggling. The proliferation of dedicated federal ministries shows an increasing tendency for the Kremlin to centralize governance of its most far-flung regions, from the southwest to the northeast. To think that bureaucrats in Moscow could administer two areas thousands of miles apart, one near Turkey and the other close to Alaska, suggests that although Russia’s superpower status may have been in doubt, its “supergiant” status, to use Putin’s word, is unquestionable. 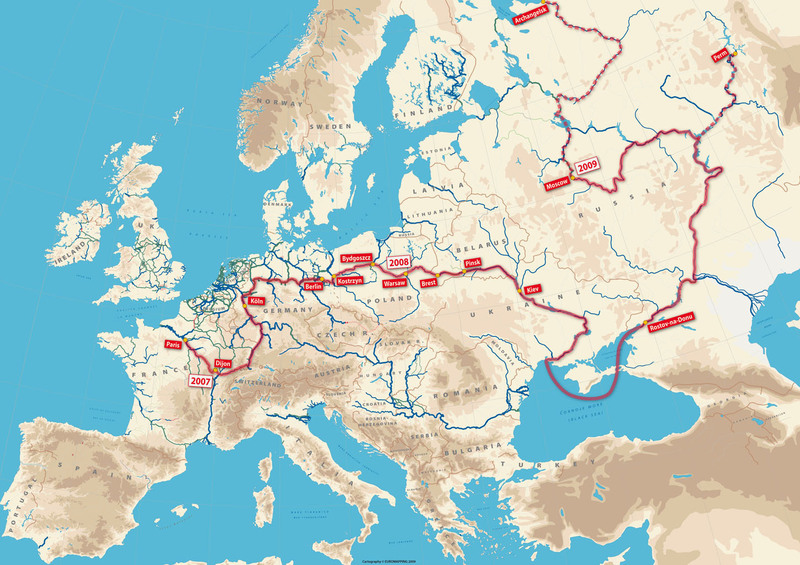 It may be hard to believe, but already, it’s possible to get from the Sea of Okhotsk to the Asov Sea via the Northern Sea Route and Russia’s inland waterways leading south from Arkhangelsk via Moscow to Rostov-na-Donu. 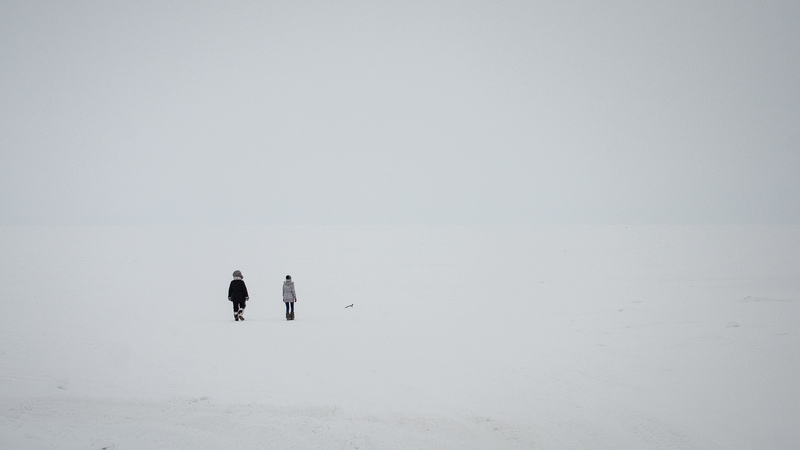 Chukotka: People walking at the edge of empire. Photo: Flickr/Ivan Frolov, Creative Commons license. The entire section of the transcript regarding the Arctic is worth reading, so I have copied it from the Kremlin’s website below, translating it from Russian to English using Google Translate and making a few grammatical corrections myself with my limited knowledge of Russian. E. KRYUCHKOVA: Good afternoon! Kryuchkov Elena, Nizhny Novgorod State University named after Lobachevsky. If it is possible, let express request from the Nizhny Novgorod delegation – to be able to take a picture with you after the meeting. Thank you. VLADIMIR PUTIN: Regarding the Arctic – the most important region of Russia. In general, we have the greatest country in the world by area. You know, even after the collapse of the Soviet Union, which was such a supergiant, still in today’s Russia – the largest country in the world by area – 70 percent of our territory belongs to the north or to the territories of the Far North, we must understand it. As for the Arctic, it is a special region: it is not only severe, but it is very promising. Once, Lomonosov said that Russia will grow through Siberia – and in fact the way it happens, it will grow precisely through the Arctic. And not just because there is a huge, global, I would say – general planetary mineral reserves, we are talking about gas, oil and metals on – but also because it is an extremely convenient area for the development of transportation infrastructure. Here, there is the Northern Sea Route, which we have begun to revive. You’ve probably read about it many times yourself, probably, the students talk about it, it will be quite a strong competitor to all existing transport links, which are designed to minimize the cost of business in transporting goods. The Arctic plays for us a very important role in terms of our security because unfortunately, it’s the case that the United States has concentrated attack submarines not far from Norway’s coast, which can strike Moscow within 15 to 16 minutes, I remind you. But there, too, is our fleet, a significant portion of our submarine fleet. And, you know, today it is easy enough to follow boats, but if they go under the ice of the Arctic, they are not visible. This is a big problem for those who need to monitor them. In general, the concentration of our interests is in the Arctic. And, of course, we must pay more attention to and development of the Arctic, and to strengthen our position there. We are doing this now, if you notice. This applies to our plans to build a nuclear icebreaker fleet, it is for our plans to return to the individual territories, including the islands: to return economically and militarily. Just recently, I hope you saw it, (we) carried out a military assault landing there – peaceful, not belligerent. This is our land, we will be there to revive this whole military infrastructure, Ministry of Emergency Situations infrastructure, including because we need to secure the passage of convoys of ships and trade routes, and not in order to fight and confront someone out there. Many perceive our activities as a wary, scared of this activity. We have said many times that we act solely in the framework of international law. We’ve always acted, and so intend to act in the future. There’s a lot of interests of other states. We will consider these interests and to achieve acceptable compromises – of course, defending their own interests. Now, regarding the territorial-administrative division and the organization of work in these areas. We have a federal state and we have some territories that are all immersed in the subjects of the Russian Federation, which have certain rights in the management of these areas. There are some functions, which are assigned to the federal government, and some of the functions are assigned to the regional and local governments. Of course, in some cases, where special attention is required, we create … Yes, by the way, in some countries, in spite of their federal structure, some of the territories are under direct federal submission. This practice exists throughout the world, it’s true. By and large, though nothing prevents us from doing it, those plans have yet to materialize. Look, now we have organized several regional ministries involved in territorial development: it is in the Far East, it is in the North Caucasus, it is in the Crimea and Sevastopol. We still need to understand how it works; it is necessary to realize it in practice. Even now, when everything is working, some experts tell us: it would be better if a deputy were at each ministry, a directly appointed deputy for some areas. Then, maybe it would work even more effectively. Because the Ministry of Regional Development was created, but in order to decide something, it must run it by the Ministry of Finance and the Ministry of Economic Development. But it is too early to draw any definitive conclusions. It is necessary to see how it will work in all areas. In addition, some of the things of a social nature, even in the use of natural resources, one way or another, it is necessary to agree with the people who live in the territories. Take, for example, ecological issues: while complying with ecological requirements for the production of raw materials, including hydrocarbons in these northern territories, this production and this work should be carried out so as not to disrupt the natural way of life and the economy, the natural lifestyles that have existed for centuries and the economic activity of the local population. Whether it’s possible to have it all finely adjusted from Moscow, I do not know, not sure. But what you suggested, has a certain sense, we will calmly watch how this work comes, as we have no such plans.